Changes animal looting into a process of dressing, skinning, harvesting, and butchering. Adds hunting knives, many new alchemy ingredients, animal meat, recipes, and foraging. Hunterborn Tweaks This mod won't work without this. Modder's Will: If I ever disappear and fail to respond to three consecutive PM's or mails over a period of three months, all rights to this mod revert to the Nexus community and you may all do as you see fit - update it, delete it, fix it, change it, republish it, go nuts. Hunterborn changes the simple routine of kill-and-loot on animals into something more immersive. 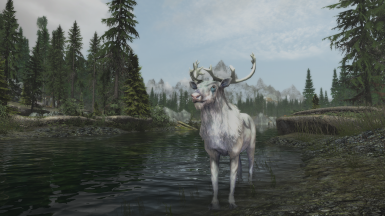 This mod has its origins in Realistic Wildlife Loot, but I wanted something more in-depth for the actual process of dressing down a kill, skinning it for its pelt, taking material from it for alchemy, and finally butchering its meat - based on the animal's weight, not just a single cut of venison. This is the Skyrim Special Edition version of the mod. It is currently functional (mostly) without SKSE or the MCM, but some of its compatibility with other mods has been scaled back. Its configuration is handled through a messagebox ability, similar to the ones used by Frostfall and iNeed. The most significant change Hunterborn makes to the game is taking away the loot window from most wildlife. Instead, you must first choose whether to dress it (clean the carcass and prepare it for processing) where it lies, or pick up the carcass and take it back to your camp / lair / nearest vendor. When you drop the "carcass" from your inventory, the original animal's body will appear at your feet, where again you have the choice to dress it, or pick it back up. After dressing a carcass, you're able to skin it, harvest it for ingredients like antlers, eyes, teeth, even hearts, and also butcher it for meat. Field Dressing - the first step in rendering down an animal for its goods is to "dress", or "clean", the carcass. This is a simple process that eliminates the most common causes of meat spoilage, and usually involves exsanguination. Skinning - after dressing the carcass, usually the next step is to skin it - though you can choose these actions in any order, and skip any of them as well. Harvesting - Besides the pelt and the meat of the carcass, all animals will have valuable materials that you can harvest from them. Most of these materials are alchemy ingredients, and Hunterborn adds many new custom ingredients for you to harvest and use in the creation of poisons and potions - and the effects on these custom ingredients have been designed to be specifically useful for hunter-style play. Butchering - Hunterborn adds new custom meat types for all of the hunting game in Skyrim - and even for monstrous creatures like chaurus and dragons, if you have Monster Hunter enabled. Elk will have a distinct kind of venison, foxes and wolves have their own meat, and even mudcrabs and slaughterfish can now be a source of sustenance. When first started, Hunterborn assumes that you are a novice hunter with no experience, so the first time you field dress a carcass, it will take a lot of time, especially if it's a larger carcass. You'll get faster at dressing, skinning and harvesting every single time you complete the action and you will get better (higher quality, and more) results as your skinning and harvesting level increases. Turning on the hunting knife requirement will also make a difference in your yields. There are a plethora of other features for hunter-style play: Hunting knives that can give bonuses to skinning and harvesting; 47 new alchemy ingredients that you can harvest from animals (and monsters), some with unique effects; new meat types and cooking recipes for Skyrim's wildlife; Scrimshaw crafting for animal bones; storage-where-you-need-it in the form of hunter's caches; and even foraging with location-specific results. A detailed readme and an additional spoilers readme are included. Scrimshaw is a crafting system unique to Hunterborn intended to provide multiple uses for the bones you harvest from animal (or monster) carcasses. Use it to craft bone weapons, hunting knives, arrows, armor and jewelry. Polish animal eyes for new ingredients. Engrave Bones to cure diseases. Create cache markers to store your stuff. New recipes are unlocked as you increase your Harvest skill. Forage - search the surrounding terrain for useful materials which can include edible plants, local alchemy ingredients, animal bones, and some miscellaneous items such as firewood. The materials you find will be based on the environment - herbs and edibles are plentiful in the south, while north and at higher elevations it will be difficult to find much of anything. Level Foraging to unlock Bounty and Botany perks and improve Sense Direction. Sense Direction - immersively discover the direction you are facing. Accuracy improves as you level your Foraging skill. Bounty is automatically unlocked with Forage level 5. Bounty provides a chance for extra materials when harvesting ingredients from plants, similar to the Green Thumb Alchemy perk. It is disabled by default in the MCM. Botany allows the player to learn extra effects from ingredients by consuming them. This works identically to the Alchemy perk Experimenter. Improve Forage to level 4 to unlock the first rank. Animal Lures are crafted while drunk on Strange Brew. Smelly Meat lures a nearby aggressive wolf. Tasty Carrot and Chicken, however, will tame Rabbits, and Foxes (including snow foxes) making them permanent animal followers. Primitive Cooking is a new crafting skill allowing the player to sear meat over an open flame. It needs no furniture, although you must be standing close to a heat source, and it recognizes all fires in the game. Monster Hunter is an optional module in Hunterborn that extends the same basic idea - you must take time and work on a slain monster's carcass to acquire material components, including meat - to the basic monster types. Monster Hunter is now on by default. Blood and Venom - with Monster Hunter enabled, you'll be able to extract either venom or blood from monsters. Chaurus and (Frostbite) spiders yield venom; dragons, trolls and werewolves yield blood, though dragons do not yield blood unless the "corporeal dragons" option is enabled. Potions and Poisons - Troll and werewolf blood can be used to create either a beneficial potion or a poison. The strength of the result is determined by your harvesting level. Dragon's blood is different. Rather than using ingredients and your harvesting level, you gain access to different recipes by learning new dragon shouts. Rites of Hircine - What does this Strange Claw do? Hunterborn includes a set of three hidden quests that unlock unique abilities. These quests don't show up in your journal and they don't give you many hints on how to proceed. Unless you happened upon a hunter NPC selling a certain book, it can be very challenging to solve the three quests on your own. Dawnguard DLC and Dragonborn DLC are required. If you have Hearthfire, Hunterborn will detect it and automatically provide goat horns and mudcrab legs, no patch needed. Campfire - Highly Recommended - Forage for deadwood, branches and kindling. Use CF campfires for primitive cooking. Craft Hunterborn arrows with Deadwood. Frostfall has some inbuilt compatibility and no patch is required. Full compatibility is a work in progress. iNeed has some inbuilt compatibility and no patch is required. Full compatibility (mostly cooking recipes) is a work in progress. LOOT / Bash / general notes: Hunterborn is almost strictly a script-based mod, so it shouldn't matter too much where it is in your load order. The optional Leather patches may require some extra attention, however. Also, mods which specifically change the loot on animals (adding different pelts or meat or such) will not generally be compatible, although you can use the "manual loot" option from Hunterborn's menu to loot those items first. If in doubt, check the discussion tab for stickies, or ask in a post. Version 1.6.2 is an experimental feature release. It contains two new features: Soups (and Stews), and Tracking. These features may not be stable. Check the Posts tab for any major bug reports or discussion. The Soups and Stews feature adds a new dynamic crafting system that lets you mix and match your ingredients in whatever combination, instead of needing specific ingredients for specific recipes. To do this, it adds a total of 5,560 new soups, and 24,661 ways to craft them. Besides activating the patch in the installer, you will need to enable this feature in game with the config menu. You'll need a wooden bowl, some water, and a cast iron pot, to get started! The Tracking feature is a new part of Forage. You'll always automatically attempt to track while out foraging, and you get better as your Forage skill increases. This feature may still be buggy, and could be changed into a discrete system in the future. It is intended to be immersive, not "gamey", so you'll only get general indicators of direction, not a glowing magical trail of footprints leading you straight to the animal. Thank you all very much for permitting your work and resources to be included here! For full details on image and resource permissions see the included Hunterborn Tips and Spoilers file. A special thank you to Teabag86 for continuing to improve and support Hunterborn while the mod author is "retired." Also many thanks to Kryptopyr for her assistance with scripting and compatibility issues and Dr Monops for testing, scripting and screenshots!